Sample of WitnessWay, the temporary view of the WitnessTable with Waymarks added to facilitate navigation to the sharee in RootsMagic. the first few wayfinding views, which, when opened, will show the Waymarks as the first column, followed by all the columns of the table being viewed, as in the WitnessWay screenshot above. This query can be copied to the SQL editor and executed; then the SQLite Expert editing tool can be used to edit these fields and others in the database table it opens. Snippet from SQLite Expert sidebar showing the Wayfinder views. Sample result from the Full Text Search on the term “clerk”. Waymarks for result #3 in the search were followed to this screen snip from the RootsMagic Place List. Hopefully, the Waymarks list is self-explanatory and can be easily followed through RootsMagic. Editing the database is more safely done in RootsMagic but there are circumstances which can only be addressed through SQLite or the user may prefer doing through SQLite. You are reading this because there is something you want to do with your RootsMagic database that you cannot do with RootsMagic itself! The LocateQuery for search result #3 was copied and executed giving this screen. The fields without the “_1” suffix can be edited (take all necessary precautions). With SQLite Expert, right-click on the field and select Text Editor. Note and other fields designed for large amounts of text are stored as binary BLOBs and are so indicated by the … icon. The SQLite Expert text editor works with them, too. The Post Edit button is key to affecting the database. Always run the SQLite Database Tools before and after you make changes externally and make a backup before, too. While there are several ways to start an edit, making the changes stick in the database requires a click of the Post edit button, enabled when a change has been made to an onscreen field. Script #3 is dependent on the execution of both #1 and #2 preceding its running. #1 and #2 are independent of any other script. On very large databases, scripts 2 and 3 may consume tens of seconds. In one example 40 and 30 seconds, respectively. However, RootsMagic’s Find EveryWhere took over 180 seconds for the same search and does so for each new search. Script 2 need not be re-executed for each new search by script 3 so there is a distinct time advantage. All the views and tables created by these scripts are temporary, in-memory and are destroyed when the SQLite manager is closed. 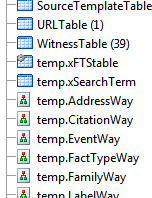 RM7_5_WaymarksViews.sql no longer omits family events from EventWay and dependent views.